This One Pan Italian Sausage and Eggs dish is LOADED with flavors and textures. 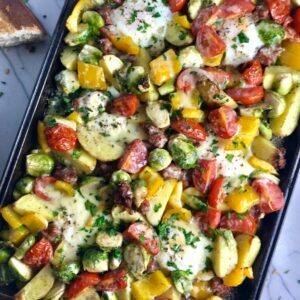 You get the salty Italian sausage, sweet bell pepper, creamy potatoes, sweet and juicy tomatoes, meaty brussel sprouts, creamy eggs, and salty, nutty cheddar cheese. Best of all, the entire meal cooks on one large pan – and believe me there is plenty of food to go around! 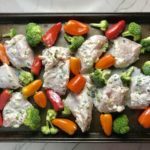 Lately I’ve heard from so many Moms and Dads saying that while they appreciate prep-ahead instructions for recipes, they still need even easier recipes. They need ULTRA EASY! So, I asked, what would make recipes ULTRA EASY? The answer was either (a) Few Ingredients or (b) Everything cooks in One Pot/Pan. Of course, there were those that want both too! 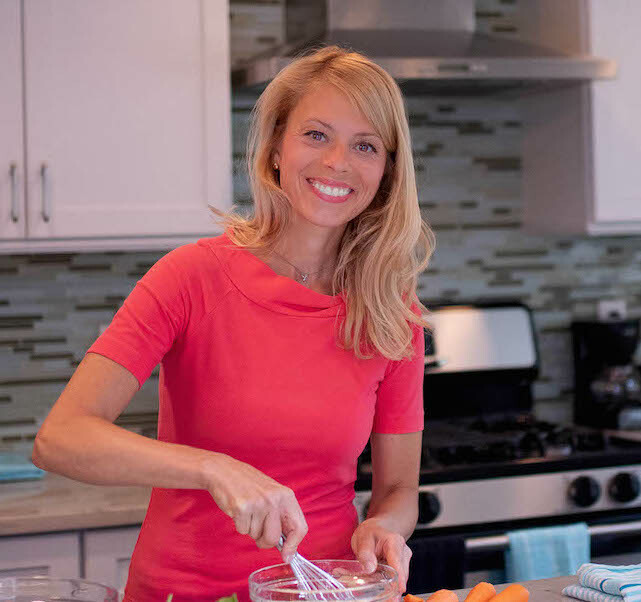 Stay tuned for a new series of 5-Ingredient recipes that are coming! But today, I give you another One-Pan Wonder: One Pan Italian Sausage and Eggs. 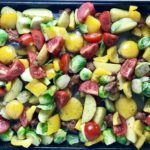 Here are a couple other One Pan/Pot Meals that you may love to try! 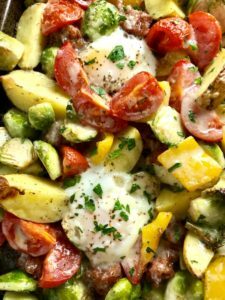 I mean, just look at this eggy goodness nestled into the veggies and sausage with cheese melted on top…YUM! Since this recipe is all about simplicity – and of course flavor! – it calls for store-bought Italian Sausage. However, you can very easily make your own homemade turkey Italian Sausage ahead of time and even make a few batches and freeze! CLICK HERE for the easy recipe for Turkey Italian Sausage. If you do make the Italian Sausage, it can be made ahead and stored in a bag or container. Trim bottom of Brussel sprouts and cut them in half. Put in large storage bag. Cut 1 sweet bell pepper into bite size pieces (red, yellow, or orange will all be great). 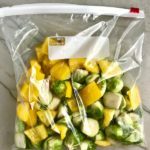 Add to same bag as Brussel sprouts. Mince the garlic and add half to bag of Brussel sprouts/peppers. Save half for the potatoes. (you will wait to cut and season potatoes the night you cook). Tip! To make mincing garlic SUPER EASY, I use a Garlic Press. I crush the garlic with the back of a knife and remove the skin. Then I place it in the press and scrape the minced garlic off with a knife. So simple and my hands don’t smell like garlic for the rest of the day! Chop the parsley, adding 1 tbls to veggie bag and saving rest in storage bag. Grate cheese (if needed) and put in storage bag. 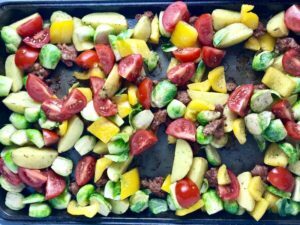 Place the bag of brussel sprouts and peppers, the extra garlic, the parsley, the Italian Sausage and the cheese on a sheet pan or in a large bowl to keep together as your Meal KIT! 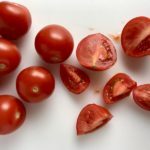 The potatoes and tomatoes can stay out of the fridge. Cut the potatoes into quarters, season with extra virgin olive oil, minced garlic, Italian Seasoning, salt, and pepper. Roast in oven for 25 minutes. 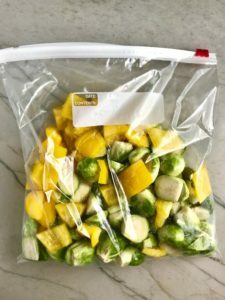 To the bag with Brussel Sprouts & peppers, add the salt, pepper, and Extra Virgin Olive Oil. Gently rub around to completely coat the veggies. Quarter the tomatoes and season with salt and pepper. 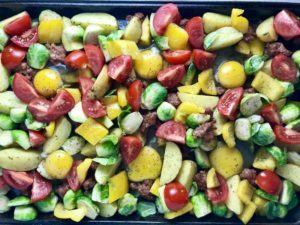 After 20 minutes in the oven, remove the pan with the potatoes and add the seasoned veggies from the bag plus the tomatoes. Also add pieces of the sausage around the pan. Place back in the oven for another 15 minutes. After 15 minutes, remove the pan and create 6 holes in the veggies for the eggs. Crack 1 egg into each of the 6 holes. Then, add the shredded cheese all over the top of the veggies, sausage, and eggs. Last, sprinkle parsley over top. Place back in the oven for a final 10 minutes to cook the eggs and melt the cheese, slightly browning it on top. Serve this complete one pan meal on a plate, garnish with a bit more fresh parsley and Enjoy! This One Pan Italian Sausage and Eggs is LOADED with flavors and textures. 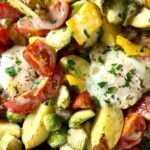 You get the salty Italian Sausage, sweet bell pepper, creamy potatoes, sweet and juicy tomatoes, meaty brussel sprouts, creamy eggs, and salty, nutty cheddar cheese. Best of all, the entire meal cooks on one large pan! Mince 2 cloves garlic, add 1 to bag of Brussel sprouts and peppers. Save the second minced garlic clove for the potatoes (you will wait to cut and season potatoes the night you cook). Chop the parsley. Place 1 tbls in with the brussel sprouts and peppers. Place the rest in a storage bag. On the night you're ready to cook, pull your KIT out from the fridge! Preheat the oven to 400 degrees F. Spray the bottom of a large sheet pan with extra virgin olive oil. 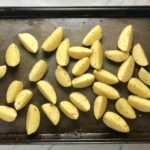 Cut the potatoes into quarters. Place on the pan and drizzle with 2 tsp extra virgin olive oil, then toss with 1 clove minced garlic, Italian Seasoning, salt, and pepper. Roast in oven for 25 minutes. To the bag with Brussel Sprouts, peppers, garlic, and parsley, add the salt, pepper, and Extra Virgin Olive Oil. Gently rub around to completely coat the veggies. After 15 minutes, remove the pan and create 6 holes in the veggies for the eggs. Crack 1 egg into each of the 6 holes. Then, add the shredded cheese all over the top of the veggies, sausage, and eggs. Last, sprinkle parsley over top. Place back in the oven for a final 10 minutes to cook the eggs and melt the cheese, slightly browning it on top. 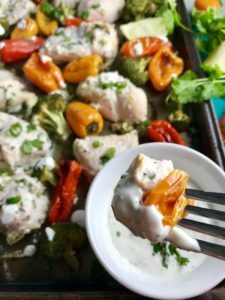 I recently posted a One-Pan Parmesan Chicken & Asparagus Recipe and have received such great feedback on it that I created another one-pan dish: Cilantro Lime Yogurt Chicken & Sweet Peppers…with Broccoli too! Tangy, Salty, Creamy, Moist, Citrusy, and DELICIOUS! 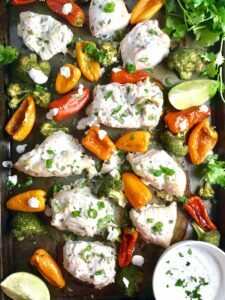 This Cilantro Lime Yogurt Chicken & Peppers is a one-pan wonder that is so simply paired with a crusty bread, rice, orzo, Quinoa, or pasta! The yogurt marinade tenderizes the chicken helping to keep it moist and tender as it cooks. The flavors seep into the meat and coat the outside so when it roasts, it gets this sweet and salty crust. The mini sweet peppers are not only cute, but so delicious and sweet. The broccoli is crunchy and crisp and completes this delicious meal. 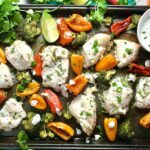 Why do I love one-pan recipes? For this recipe, you start by marinating the chicken with a delicious yogurt marinade. Marinades of course add flavor, but they can also tenderize proteins, as is the case with a yogurt marinade. It is believed that the calcium in dairy products activates enzymes in meat that break down proteins, thereby making the meat more tender. 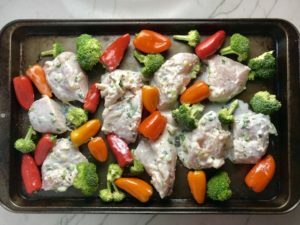 This cilantro lime marinade adds such amazing flavor and makes the chicken so tender so as it roasts in the oven it says moist, juicy, tender and so flavorful. 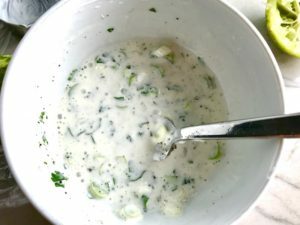 To start, add 1/4 cup yogurt to a bowl with the juice of 1 lime, minced garlic, 1 tablespoon of cilantro, 1/4 teaspoon salt, 1/4 teaspoon fresh ground pepper. 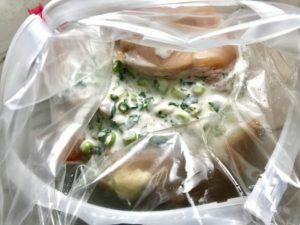 Mix and then add the marinade to a baggie with the chicken, seal the bag, then smush the marinade around the chicken pieces so that all are coated with the marinade. Let sit in the refrigerator for at least 1 hour, up to 8 hours before cooking. 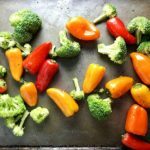 Spray a large cooking sheet pan with Olive Oil cooking spray and place the the whole mini peppers & broccoli florets on the pan. Drizzle 1 teaspoon of extra virgin olive oil over top. Sprinkle with salt and pepper and toss with hands to coat every veggie with the oil and seasoning. Add the chicken pieces with marinade to the pan, spreading the veggies around the chicken. Cook for 25-30 minutes in a 375 F degree oven or until the chicken reaches a 165 degrees F internal temperature. 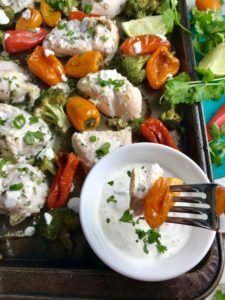 While the chicken is cooking, make the Cilantro Lime Yogurt sauce to pour over top. 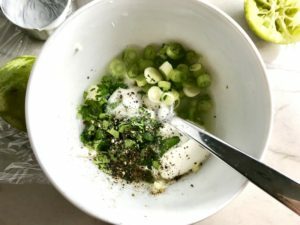 Add 1/2 cup yogurt to a medium size bowl with the lime zest. juice from a quarter of the remaining lime, 1 teaspoon cilantro, and 1 teaspoon scallion greens. Finally add a dash of salt and fresh ground pepper to taste. Mix to combine. I love all of the amazing colors in this dish that make the presentation on a platter so amazing. You can serve it with rice, orzo, quinoa, or pasta. OR EAT IT ALONE!! 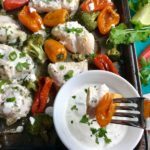 Serve with a sprinkling of cilantro, scallions, and a drizzle of the Cilantro Lime Yogurt Sauce. Zest 1 lime and set aside in an airtight bowl. 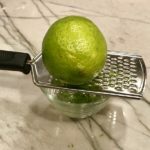 Save the lime that was zested in a separate airtight baggie or container so it doesn't dry out. Wait to juice the 2 limes until ready to cook. Thinly slice the scallions, keeping the whites and greens separated. Peel and mince the garlic. Chop 2 tablespoons of the Cilantro. 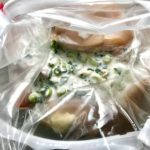 If doing this step 1-2 days before cooking, keep everything separated in 1 storage container or in separate baggies. Cut the chicken breasts into large pieces about 2-3 inches each, not bite-size. Store in sealed 1-gallon plastic bag. 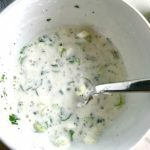 Add 1/4 cup yogurt to a bowl with juice of 1 lime (use the zested lime), minced garlic, 1 tablespoon of cilantro, 1/4 teaspoon salt, 1/4 teaspoon fresh ground pepper. Mix to combine. Add the marinade to the baggie with the chicken, reseal the bag, then smush the marinade around the chicken pieces so that all are coated with the marinade. Let sit in the refrigerator for at least 1 hour, up to 8 hours before cooking. Add the chicken pieces with marinade to the pan, spreading the veggies around the chicken. Cook for 25-30 minutes or until the chicken reaches a 165 degrees F internal temperature. While the chicken is cooking, make the sauce to pour over top. Add 1/2 cup yogurt to a medium size bowl with the lime zest. juice from a quarter of the remaining lime, 1 teaspoon cilantro, and 1 teaspoon scallion greens. Finally add a dash of salt and fresh ground pepper to taste. Mix to combine. This one-pan recipe is great on its own, but you can definitely make rice, pasta, quinoa, orzo, or couscous on the side. 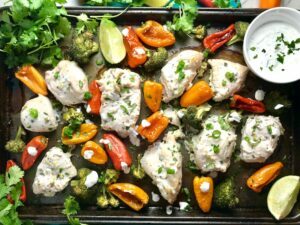 Plate the chicken, peppers, and broccoli and garnish with a drizzle of the Cilantro Lime Yogurt Sauce and a sprinkling of cilantro and scallion greens.